Check out a new whitepaper from Greg Ferro that provides a detailed overview of 5G and its relevance to the enterprise. 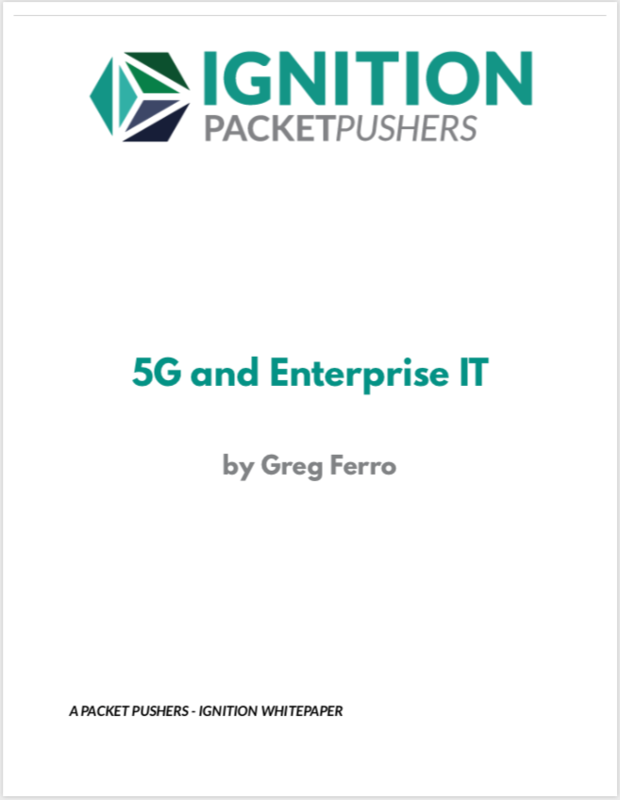 Ignition members in the premium tier can download “5G And Enterprise IT” as part of their subscription. Head on over to Ignition.packetpushers.net, log in, and you’ll find it in the Downloads section. 5G technology will drive the next generation of mobile networking. Telcos, service providers, and equipment vendors are gearing up for a massive rollout of new technologies and products to bring 5G services to market. This whitepaper considers 5G’s impact on enterprise networking and on service providers. This paper provides background and insights into 5G so that an enterprise IT professional can speak knowledgeably when needed. This is an overview of the technology and its potential impacts, and may spur the reader to further investigate the topic. If you’d like to join Ignition in the premium tier to access this whitepaper and other exclusive content, click here to register. An annual subscription is $99. We also have a free tier that gets you the Human Infrastructure newsletter, access to Virtual Design Clinic videos, and more.